The Halifax Explosion killed nearly 2,000 people. Here is where most of them lived. On the 100 year anniversary of the Halifax Explosion, Global News set out to map the homes of as many of the victims as we could - and the results paint a staggering picture of the human cost of one of Canada's greatest tragedies. Nine days after the terrible Halifax Explosion, on Dec. 15, 1917, Mary Nehiley went to the Chebucto Road School and walked down the stairs into a vast, harshly lit basement. The building was silent, emptied of students and filled with the city’s dead. Nehiley had something she needed to do, and by the time she left the improvised morgue, it had been done. The city around them was too wounded, too damaged on too enormous a scale for much in the way of shielding people from what had happened — a pile of new, roughly stacked pine coffins stretched all the way down one city block not far away. Nearly 2,000 people were dead, about 500 of them children, and thousands more injured, dozens of them blinded. People left homeless were sleeping in canvas tents set up in the drifting snow on Halifax Common. To add to the misery, a blizzard had set in the day after the explosion, and the weather turned bitterly cold. We don’t know how many white sheets had to be lifted for Nehiley, whether she was prepared for the scale of what she saw when she entered the cold basement, or how long it took. But by the time it was done she had found two of her nephews, James Fraser, who was seven, Colin Fraser, who was six, and two of her nieces: Margaret Fraser, 4, and little Winifred Fraser, who was a toddler. In James’s pockets there were: three hand-whittled pencil stubs, a grey comb, a large green marble and an eraser. The Fraser children lived with their mother at 1406 Barrington St., near the dock at the foot of Richmond St. in the North End. 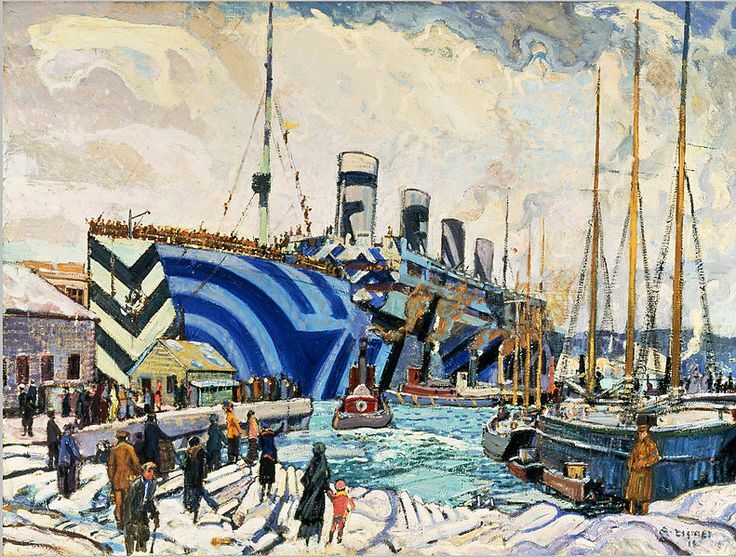 It would have been endlessly interesting, with ships coming and going, many of them warships with the jarring dazzle camouflage of the day, and vast convoys massing in the Bedford Basin and being escorted slowly out to sea past their front door. Their father, also named James Fraser, was away at the war. On the morning of Dec. 6, the cargo ships Imo and Mont Blanc collided in the harbour, starting a fire on Mont Blanc. Mont Blanc was full of explosives — one-sixth the destructive force of the early atomic bombs. Mont Blanc drifted as it burned, until it crunched against the dock at Richmond Street very nearly on the Frasers’ doorstep, and detonated with an inconceivable, primal violence. People died in nearly every house on their block: four at 1408, seven at 1410, four at 1412, three at 1414, three at 1416, five at 1418. Click on a point to see details about the address; click on a name to see details about a person. Enter Richmond St & Barrington St, Halifax in the search box to go close to the site where the Mont Blanc exploded. Nearly every house in the immediate area has its dead, some as many as 10 or 11. Enter 3115 Veith St, Halifax to go to the site of the Protestant Orphanage, where 28 people died, most of them children. Enter 3340 Barrington St, Halifax to centre the map on the Frasers’ block. Zoom out (and switch to satellite view if you like) to see how the spine of the Halifax peninsula protected homes on its west side from the blast wave and tsunami. Robie Street is a clear dividing line. Victims with homes west of Robie Street seem to typically be children, elderly, or adults with jobs in the harbour or dockyard. Harold Floyd, for example, worked in the Richmond railway station at the docks. There are also few deaths in the South End, where the Citadel was between homes and the explosion. When Global News, along with Fred Vallance-Jones of the King’s College journalism school and his students, set out to map the dead of the Halifax Explosion, we quickly found that one of the biggest problems was caused by the explosion itself. The explosion was the worst single event that has ever happened in Canada, in terms of loss of life, and the largest human-caused detonation until the U.S. atomic tests in 1945. When it came time to rebuild what was formally referred to as the “devastated area,” in some places a new street system was laid out. A renumbering of Halifax’s streets in the 1960s confuses things further. We started with a list of 1,836 known dead from the Nova Scotia Archives. Of these, 1,439 were Halifax residents with addresses that could be placed on the map of modern Halifax. We were able to map 437 victims who were 12 or under to their homes in Halifax. The map misses 64 victims who lived in Dartmouth, which was also hit by the blast wave and tsunami — with the data available, it wasn’t possible to place them on the map of modern Dartmouth. Another 55 came from elsewhere in Nova Scotia — West Pubnico, North Sydney, Black Point. One unfortunate man, the cook on the steamship Curaca, came from China. Nearly all of Curaca‘s crew died when the ship was physically flung across the harbour. Objects found on the body of James Fraser, aged 7. Fraser, a younger brother (Colin, 6) and two younger sisters (Margaret, 4, and Winifred, 1) died in the explosion. Were all the victims documented? It was hard to know at the time —the city was in such chaos for so long that an undiscovered body was found as late as 1919 —and impossible to know now. WATCH: Ahead of the 100th anniversary of the Halifax Explosion, two groups with a common link to the Halifax Protestant Orphanage are partnering to honour the lives of the children lost that day. If there is a lesson, it’s that war unleashes forces that are impossible to predict or control, once set in motion. The war brought a vast destructive force to the centre of Halifax, and unplugged, one by one, the details that a peacetime society would have insisted on. Mont Blanc wasn’t flying a flag signalling its dangerous cargo, for example, because it might catch the attention of German submarines. Only a few officials and Mont Blanc‘s crew, who shouted warnings as they rowed frantically toward Dartmouth, had any idea of what was about to happen. In peacetime, a cargo of such destructive power wouldn’t have been allowed in the harbour at all, but in war, that rule would have meant that ships kept outside would be at the mercy of U-boats. So, decision by decision, the consequences of small errors grew and grew. No very serious mistake caused the explosion in the immediate sense — just some hurry, misunderstanding and bad luck. WATCH: As Halifax approaches the 100th anniversary of the Halifax Explosion, a new app is taking people on guided water tours of the areas impacted by the disaster. Alexa MacLean takes us on a tour. The points on this map correspond to the home addresses given for victims of the Halifax explosion who lived in Halifax and listed in the explosion remembrance book available online from the Nova Scotia Archives. The map points are approximate locations of the addresses in 1917 Halifax. As digital mapping was far in the future, address locations had to be approximated from historical records. This map is meant to display broad patterns. Further research would be needed to establish exact locations. The primary sources for addresses in the devastated area of Halifax were the map available online at and the McAlpine’s city directories for 1917 and 1915. Some address points correspond to exact address points as shown on the devastated area map, while others correspond to approximate positions along a block segment, as listed in the city directories. The locations are only as accurate as the historical records and are pinpointed on a modern map as closely as could be achieved using GIS software. Certain addresses were derived using the civic address points file available from Halifax Regional Municipality’s open data site. Special thanks to Garry Shutlack, Senior Archivist, Nova Scotia Archives, Philip Hartling, Reference Archivist, Nova Scotia Archives, Susan McClure, municipal archivist, Halifax Regional Municipality, Dave Cogswell, Halifax Municipal Archives, and numerous other staff members at the Nova Scotia Archives who provided assistance. Mapping: Nicoletta Dini, Francella Fiallos, Haley MacLean, Drew May, Sofia Ortega, Alex Rose, Gabriele Roy, Menglu Xu, Yu Zhang and Sixian Zuo. Additional research and reporting: Jessica Briand, Carly Churchill, Ava Coulter, Dorsa Eslami, Kristin Gardiner, Laura Hardy, Kaila Jefferd-Moore, Kathleen Jones, Piper MacDougall, Nader Nadernejad, Maya Palacio, Anastasia Payne, Isabel Ruitenbeek, Julia-Simone Rutgers, Stacey Seward, Matthew Stickland, Kristen Thompson and Joshua Young.